San Luis Obispo is the perfect, affordable weekend getaway for those searching for budget travel options. Find things to do in SLO and make memories that will last a lifetime for less than $15. SLO’s affordable hotels, restaurants, and activities make it the perfect place to maximize your vacation dollars. In addition to the wide variety of outdoor activities that San Luis Obispo has to offer, including hiking, kayaking, and biking, this California weekend getaway provides travelers one-of-a-kind, yet budget-friendly attractions for all tastes and preferences. Explore these affordable vacation ideas for every type of traveler listed below. If you are passionate about art in all forms, San Luis Obispo is the perfect place to visit. SLO offers a wealth of affordable and free art museums and galleries from the San Luis Obispo Museum of Art to Art After Dark. If you’re looking for other forms of art, the summer Concerts in the Plaza series or weekly Downtown SLO Farmers’ Market feature a variety of free and lively music and dance performances. Don’t miss out on the infamous Bubblegum Alley, boasting over 50 years of chewed up bubblegum, too. Do you have a taste for fine food, but an eye on your wallet? No need to fret, San Luis Obispo is overflowing with delicious restaurants that won’t break the bank. A few local favorites include Breakfast Buzz, Firestone Grill, Frank’s Famous Hot Dogs, Splash Café, and Woodstock’s Pizza. If you’re into pairing your meals, consider visiting the market and following it up with a visit to a local winery tasting room or venture over to a craft brewery. San Luis Obispo offers all sorts of animal activities for visitors looking for a low-cost experience. The Charles Paddock Zoo is a short drive away from SLO and is perfect for a family seeking for adventure with tickets ranging from $4-5 for ages 2 and older and free for children under 2. Love aquatic creatures? Consider stopping by the Central Coast Aquarium after a free and fun afternoon visit to Avila Beach, a quaint beach town within 15-minutes from San Luis Obispo. Hoping to immerse yourself with animals? The Pismo Beach Monarch Butterfly Grove is free and a beautiful site to see from October to February when thousands of monarch butterflies migrate to the Central Coast. If you’d prefer to view from afar, the sea lions of San Simeon are a just quick drive up the Pacific Coast Highway. San Luis Obispo provides countless beer and wine tastings opportunities for those on a budget. Enjoy a 5-beer flight of tastings for a mere $5 at the Central Coast Brewing Company, or check out other local craft breweries that are making a name for themselves. If you’re a beer connoisseur, check out the list of SLO craft beers worth traveling for today. If beer isn’t up your alley, enjoy a visit to Edna Valley for wine tastings, where tasting fees range from $5-$15. Known for incredible historic sites and bucket list attractions, San Luis Obispo offers affordable options to travel back in time. Stroll through the historic Mission San Luis Obispo de Tolosa, located in the heart of downtown, to explore our local California mission or learn about San Luis Obispo’s past at the History Center, which is also in downtown. If you want to cover all of the historic bases on your weekend getaway, consider visiting each of the top historic sites in San Luis Obispo, where everything location is budget-friendly. 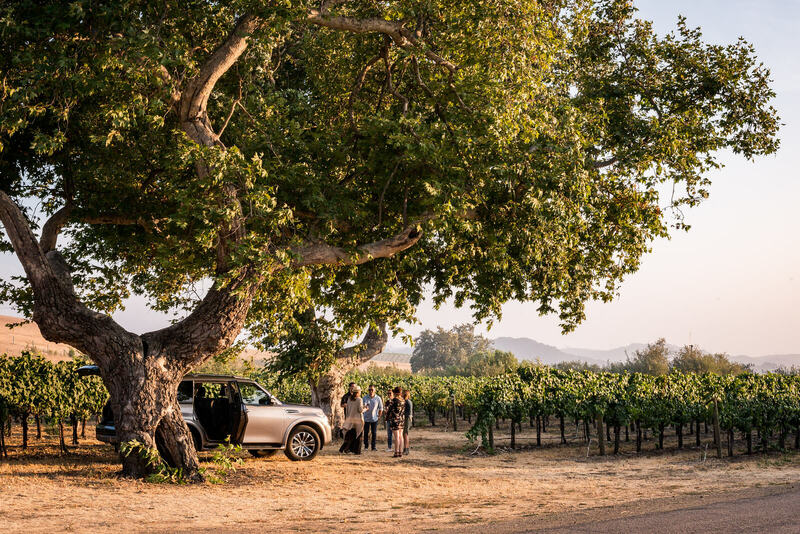 A must-see vineyard experience for wine enthusiasts seeking a guided exploration of the frontier for the most complex cool-climate varietals in California – Edna Valley. Allow 90 minutes to appreciate a progressive tasting of Tolosa’s limited production wines on our estate vineyard, Edna Ranch. Experience the transverse valley and how it generates a microclimate ideal for ripening delicate Pinot Noir and Chardonnay grapes. Take in the scenic view of the rolling hills and the iconic Islay hill as you delve into the topography and diverse soils that are optimal for producing grapes with distinctive character. 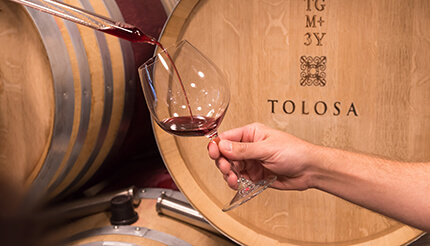 Learn about Tolosa’s attention to detail and sustainable farming practices that create Pinot Noir to rival any in the world. Limited to parties of up to 7 people. We are unable to accommodate persons under 21 for this experience. Closed toe shoes are required for comfort and safety while in the vineyards. The tour includes long periods of standing and takes place outdoors, so please dress accordingly. Experience the best of California terroir through the exclusive tasting of our 2018 Single Vineyard wines. This series of very small-lot, artisanal wines invites exploration of renowned appellations and acclaimed vineyards throughout California and confirms Edna Valley’s place in this distinguished company. Join us for a unique Barrel Tasting experience in our Barrel Loft, featuring a bird’s eye view of our state-of-the-art production facility. Reserve your allocation and build your collection before these highly acclaimed wines sell out upon release. Complimentary tasting with the purchase of a Primera Tolosa Club Membership or a qualifying purchase of our Single Vineyard Series. Produce growers, buyers, and others interested in learning about: produce safety, the Food Safety Modernization Act (FSMA) Produce Safety Rule, Good Agricultural Practices (GAPs), and co-management of natural resources and food safety. The U.S. FDA’s Produce Safety rule requires in § 112.22(c) that for each farm, “At least one supervisor or responsible party for your farm must have successfully completed food safety training at least equivalent to that received under standardized curriculum recognized as adequate by the Food and Drug Administration.” The PSA Grower Training Course is one way to satisfy this requirement; it is the only course currently recognized by FDA. Key parts of the FSMA Produce Safety Rule requirements are outlined within each module, in addition to learning about best practices in produce safety. There will be time for questions and discussion, so participants should come prepared to share their experiences and produce safety questions. The course will provide a foundation of Good Agricultural Practices (GAPs) and co-management information, FSMA Produce Safety Rule requirements, and details on how to develop a farm food safety plan. After attending the entire course, participants will be eligible to receive a certificate from the Association of Food and Drug Officials (AFDO) that verifies they have completed the training course. To receive an AFDO certificate, a participant must be present for the entire training and submit the appropriate paperwork to their trainer at the end of the course. For more information about scheduled PSA Grower Training Courses you can reach us at [email protected]. 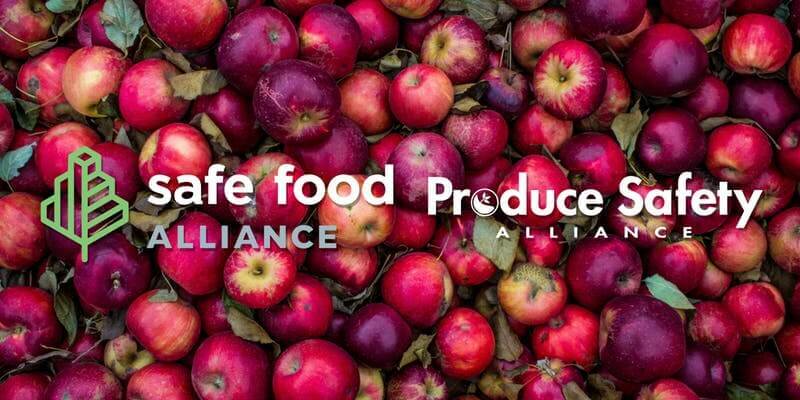 More FSMA resources are available at https://safefoodalliance.com/resources/food-safety-resources/what-is-fsma/. Sign up to receive more information about SLO, details about upcoming events, special promotions and more! By checking this box you would like to receive more information via email about events, news and offers. ©Copyright 2019 City Of San Luis Obispo, INC. All Rights Reserved.